Vending machines that distributed crack pipes for $2 cropped up on Long Island. "You think you've seen everything," Brookhaven Supervisor Edward Romaine said. A few odd vending machines that appeared on Long Island and purported to sell pens were actually dispensing crack pipes. At a news conference Monday, Brookhaven town officials described how $2 in quarters could buy "a ceramic, glass pipe" disguised as a pen for smoking crack. "You think you've seen everything," Brookhaven Supervisor Edward Romaine told NPR. "This is a new one on me." Three machines were discovered – two near a Home Depot and one by a small shopping strip. They have since been removed, Romaine said. 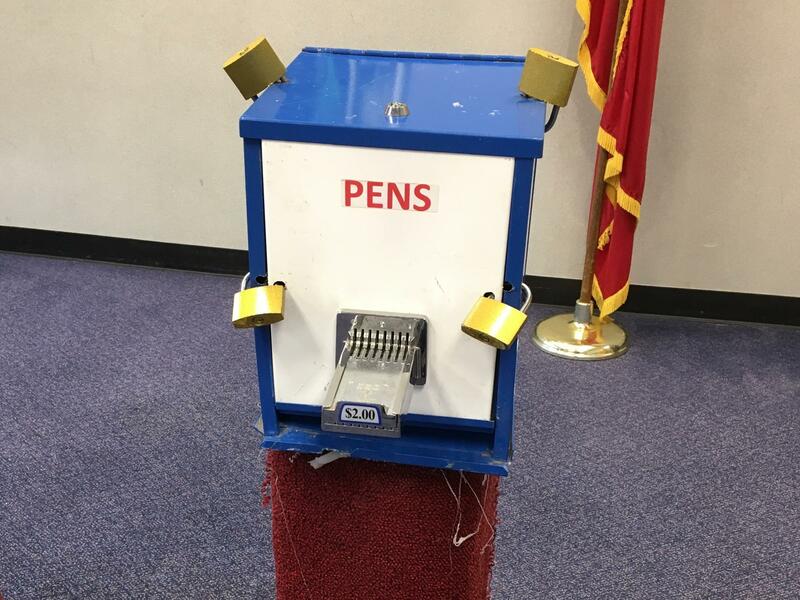 The machines were originally reported to authorities as pen dispensers, Councilman Michael Loguercio told reporters. "Many people had thought within the community, because it was the first week of school, that perhaps they were actually selling pens." Then a firefighter tried a machine and found himself holding an entirely different object, and alerted town officials. The installation of the machines required an 8-inch hole to be dug and then filled with concrete, according to Romaine. The machines were originally tampon dispensers that had been ripped out of bathrooms, he said. "Whether this is the most serious crime in Long Island, I doubt it. But I hope the police would pay attention because as minor as it may seem, it's rather brazen." Brookhaven, the most populated town in Suffolk County, has been trying to combat opioid addictions, Loguercio said. But, he went on to say, crack is still prevalent in the community. Authorities believe that because of similarities between the vending machines, the same person or people may be behind their installation. It is not illegal to sell a pipe, Loguercio said, but these pipes are considered drug paraphernalia and they were distributed from machines that were illegally installed. Romaine said the district attorney will be investigating but so far no suspects have been identified.